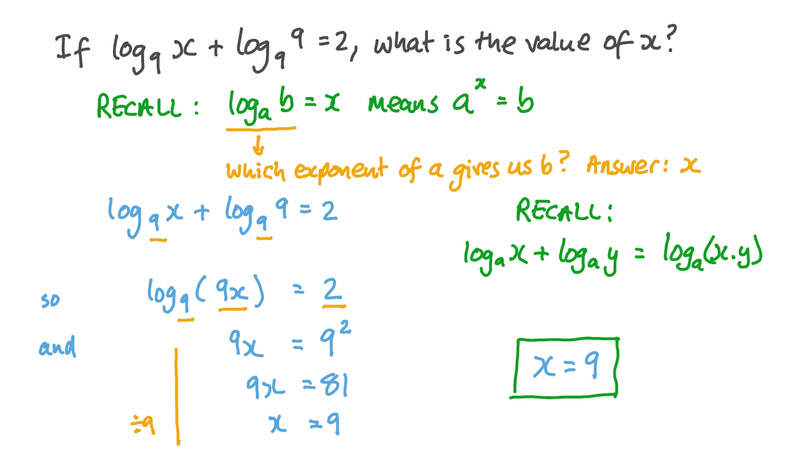 In this lesson, we will learn how to use the product, quotient, and power rules of logarithms to evaluate expressions and solve equations. If 𝑥 is any positive, real number, which of the following is equal to l o g 𝑥 𝑛 ? Which of the following is equal to l o g 𝑎  𝑥 𝑦  ? If l o g l o g 9 9 𝑥 + 9 = 2 , what is the value of 𝑥 ? Find the value of l o g l o g l o g l o g 7 7 7 7 3 2 + 8 1 0 − 5 without using a calculator. Find the value of l o g l o g l o g l o g 6 6 6 6 4 + 2 7 × 8 1 7 2 9 without using a calculator. Is it true that l o g l o g l o g 𝑎 𝑎 𝑎 ( 𝑥 + 𝑦 ) = 𝑥 × 𝑦 ? Which of the following is equal to l o g 𝑎 ( 𝑥 𝑦 ) ? If l o g l o g l o g 6 6 6 𝑥 − 7 = 1 0 , what is the value of 𝑥 ? Find the solution set of l o g l o g l o g 9 2 9 9 𝑥 + 2 = 3 2 in ℝ . Find the solution set of l o g l o g l o g ( 𝑥 + 8 ) + ( 𝑥 − 8 ) = ( 1 9 𝑥 + 2 ) in ℝ . Calculate l o g l o g l o g l o g 1 6 − 2 5 6 4 − 1 2 5 . Find the perimeter of the figure below. Determine the perimeter of the figure below. Simplify l o g l o g 7 7 1 6 2 5 6 . Find the value of 5 9 √ 3 l o g 3 5 without using a calculator. Find the value of 1 8 𝑎 + 1 8 𝑏 + 5 5 𝑐 − √ 𝑎 𝑏 − 5 𝑐 l o g l o g l o g l o g l o g 5 5 5 5 5 5 8 . Find the solution set of l o g l o g l o g ( 𝑥 + 5 ) + ( 𝑥 − 5 ) = 3 − 5 in ℝ . Find the solution set of l o g l o g l o g 8 2 8 6  𝑥 + 5 0 𝑥 − 7 9  − ( 𝑥 − 2 ) = 3 6 in ℝ . Find the solution set of 4 ( 𝑥 + 5 ) − ( 𝑥 − 3 ) = 6 2 5 l o g l o g l o g 2 2 4 2 in ℝ . Find the solution set of  𝑥  = 𝑥 l o g l o g 4 3 4 4 in ℝ . Find the solution set of  𝑥  − 𝑥 = 8 l o g l o g 2 2 2 − 7 in ℝ . Find the solution set of l o g l o g l o g l o g 9 9 2 9 9 2 7 2 9 𝑥 =  2  − 8   in ℝ .